Originally when I first became vegan 4 years ago I was substituting foods with tofu, nuts and seeds to replace the meat and dairy I used to eat. I felt great, better than I had ever felt on a regular diet however knew I could take my health to the next level and increase my energy and vitality even more. So I decided to do research and read heaps of books changing my diet slightly each time I learnt something new to see what worked and what didn’t. Then one day I came across Dr. Douglas Graham’s book, The 80/10/10 Diet after doing research on other vegans that inspire me such as Durian Rider, Freelee the Banana Girl, and Fully Raw Kristina. I believe that people who look healthy and fit is a good indicator that the diet is beneficial for your health. But I had to try it out for myself. The 80/10/10 diet stands for 80% Carbohydrates 10% Fat and 10% Protein. Which means your diet mostly consists of carbohydrates in the form of whole-foods (fruit and vegetables). Fat is only a low 10% which is crucial in your success with this diet. And believe it or not you only need to eat 10% protein.. Check out Durian Rider and Freelee if you need evidence that you get enough protein. 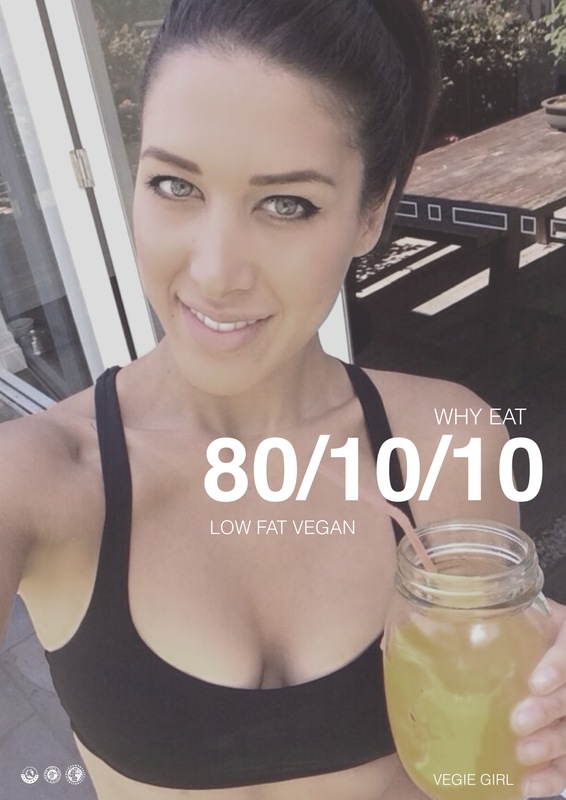 I have now been eating 80/10/10 low-fat, vegan for about 2 and a half years now and absolutely love it! I would never go back because I love eating lots of food and love feeling great! Who doesn’t? Anyone who has eaten raw for a period of time knows it is very difficult to eat out or a family functions. At first I was really strict eating about 90-100% raw depending on the day however now after 2 years I am eating about 80% raw generally Raw till 4 and have successfully adapted my diet to my lifestyle and social occasions. From my experience eating really strict can be hard on your social life. I never ate out and was very hard on myself if I wasn’t perfect. There is definitely a balance that you need to achieve for long term results and success eating the 811 way. There are plenty of places you can eat out and get a low fat vegan meal. I love places like Yong’s Green Food and Vegie Bar in Melbourne as there are always options. The first mistake I made when eating the 80/10/10 is that I didn’t eat half enough calories I needed to run my body.. It took me a while to get my head around the concept of eating massive quantities of food and not getting fat. It was scary at first! I am not going to lie. It was a massive difference from eating only 1500-2000 calories a day on a regular diet to now eating 3000-4000 calories a day depending on my exercise levels. Now I have totally got the hang of it eating 6-7 bananas for breakfast, 6-7 fresh dates and green leafy vegetables to make one meal. My family thought I was nuts at first. Another mistake I made was eating too much fat! It is so easy to do it!! Eating out makes eating the right quantity of fat quite difficult however it can be done. Oil is the absolute killer!! I stopped cooking with oils and allowed myself 1/4-1/2 an avocado a day instead. I quite happily cut out nuts all together and only eat them on the rare occasion now. 2 Litres of Green Smoothie containing 6-7 bananas, 6-7 dates, 1 cucumber, 1 stick of celery, 1 handful of spinach, water or coconut water and ice. Or a Green Juice. I usually have a cooked dinner. A big veggie curry with brown rice or Baked potato/sweet potato with veggie fillings, stir fry or soup and salads. Do you eat pasta, bread etc?